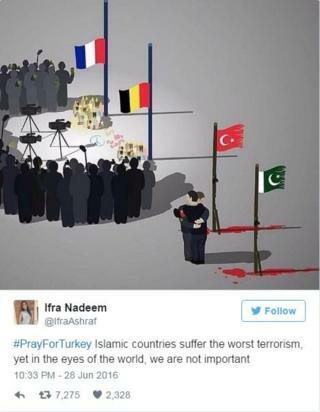 Soon after the triple suicide bombing and gun attack at Istanbul Airport on Tuesday evening, the hashtag #PrayForTurkey began trending on social media around the world. 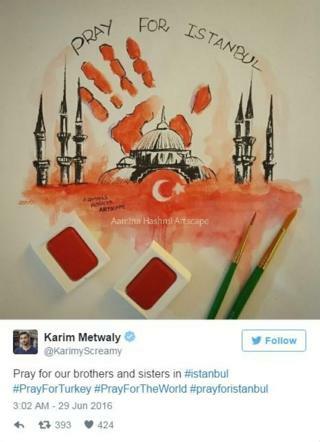 By Wednesday, it had been used more than 300,000 times on Twitter alone, by people wanting to show solidarity with Turkey and the victims of the deadly assault that has killed more than 40 people and injured more than 200. 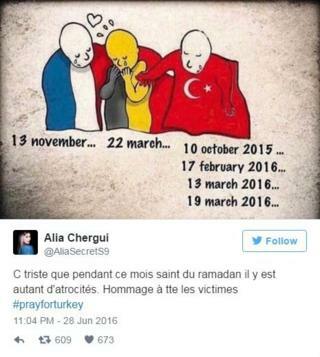 However, despite that one of the most-shared images expressed the sentiment that the attack was unlikely to receive the same international media attention as others carried out by the Islamic State group in Brussels and Paris. But there was also an adaptation of an older viral meme by Le Monde cartoonist Plantu which drew a parallel with the suffering caused by terror attacks in Belgium and France. Solidarity was also shown from Pakistan, notably in the sharing of this image by artist Aamina Hashmi. In March of this year, a Taliban splinter group said it carried out a suicide attack on a park in Lahore, Pakistan, which killed more than 70 people, including children. And this image was also widely shared around the world, here by an Indian celebrity. There have been a number of attacks in Turkey over the past year and while Islamic State group has not claimed responsibility for any of them, they have nonetheless been widely attributed to the group. Turkey’s Prime Minister Binali Yildirim says early signs indicate that IS is behind the most recent killings. In its propaganda statements, IS has strongly criticised the Turkish authorities for its “un-Islamic” system of governance, for its membership of NATO and its alliances with the US as well as for its support of non-IS Syrian opposition. 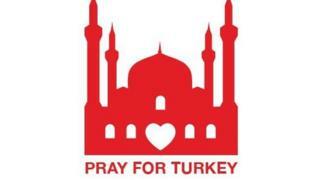 However, many of those using the #PrayForTurkey hashtag declared there could be no religious justification for this horrific attack on civilians. 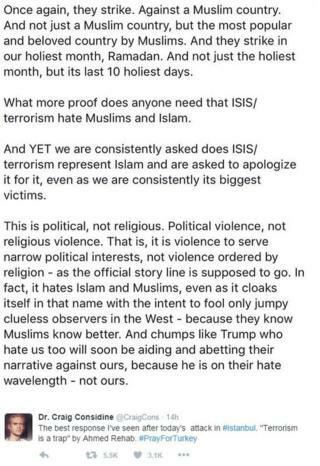 This quote posted by Dr Craig Considine, a sociologist at Rice University in Houston, Texas was shared several thousand times.